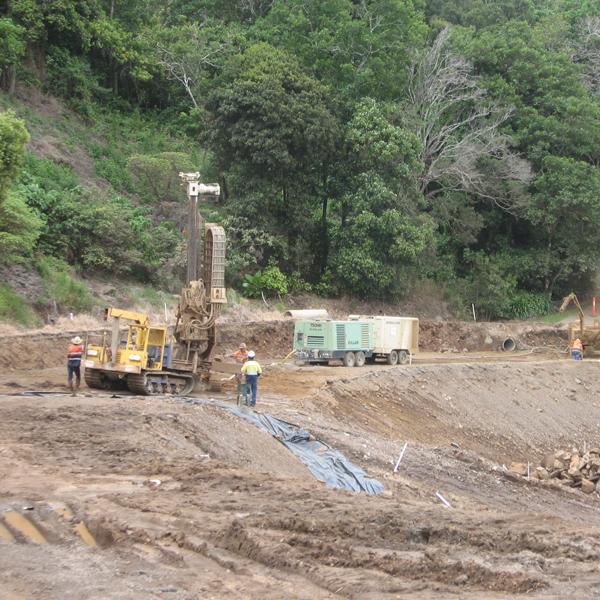 Every project that demands ground engineering has some form of drilling which is determined by the geotechnical conditions, design, product and machinery. At QPS we offer a variety of techniques which can be adopted for the best outcome for your project. 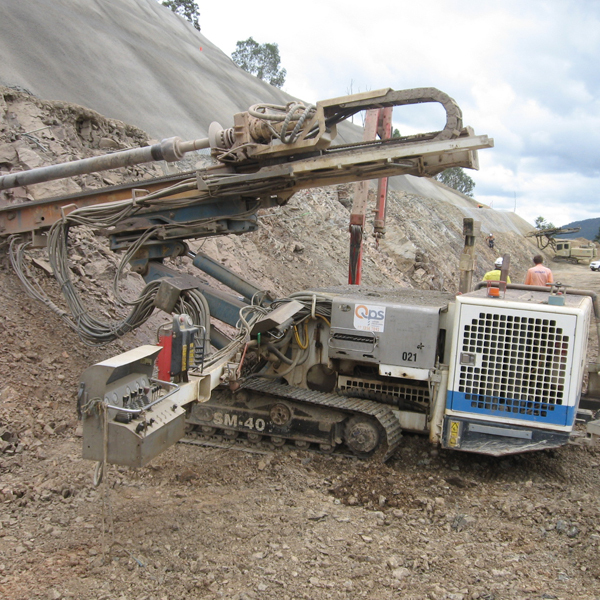 One of the most common forms of drilling, the rig is on a track platform with a rotary feed drill head. 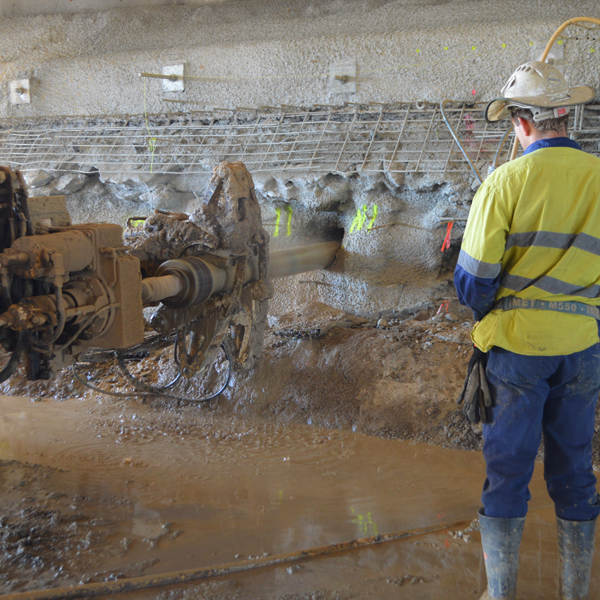 Rotary drillrigs offer high torque rotation for drilling holes from 90mm to 330mm and can be coupled with high pressure compressors combined with down hole hammers that form part of the drill string to drill hard rock. Commonly used in hard rock mining these drill rigs are designed for small hole, high production drilling in competent rock. The rig operates a top head hammer `drifter’ to displace the drill bit with air supplied by an on-board compressor. Where the ground is self-supporting for a period of time to allow for the insertion and grouting of a structural element. Where ground conditions are poor and hole collapse is likely. Drill casing is advanced with the drill string leading the casing and at the distal end of the casing a shoe if fixed to the steel pipe that provides for a connection to a purpose drill bit. The drill bit is locked into the shoe and advanced to depth and where deep casing is required sections are welded as the drilling advances. Once at depth the drill bit disengages from the shoe and withdrawn from the cased hole. Additional drilling is performed beyond the casing conventionally to achieve the required depth. This casing remains in the ground for the life of the structural element. Where ground conditions are poor and hole collapse is likely. Drill casing is advanced with the drill string and at depth the drill string is removed from the hole leaving the casing in place. The soil nail or anchor is then inserted and grouted into the cased hole. The drill casing is then progressively removed to allow the grout column to interact with the surrounding ground. As an alternative to duplex case drilling the soil nail is delivered where the soil nail bar acts as the drill rod with a sacrificial drill bit to advance to depth. Drilling grout is pumped through the hollow stem of the bar and jetted out via the drill bit to return the drill cuttings to the surface. At design depth the grout is then thickened to a specific water cement ratio and pumped through the hollow stem to the distal end to return to the surface. The secondary grouting process offers the product integrity and strength.